There are two main types of acoustic guitar: Nylon String and Steel String. Steel string guitars came later and are bigger and more strongly built as the tension on steel strings is greater than nylon. They are also a bit more difficult to play for that same reason. The 'action', which is term used to describe the distance between the strings and the fingerboard, can be adjusted at the saddle. Steel string guitars also have a metal 'truss rod' inside the neck that can be tightened or loosened to adjust the curve of the neck to fine tune the action. You can also adjust the action and exact length of individual strings at the Bridge on most electric guitars. Adjusting the length of the strings will ensure that the 'intonation' of your instrument is correct. Perfect intonation means that no matter what fretted note you play, it will be in tune. Many factors come into it: string length, action, the degree of stretch that occurs when you press the string down, gauge of strings. An instrument with poor intonation may sound in tune in one area of the neck, but not in others, so making sure it's right is critical. Unless you have bought the cheapest, most poorly made guitar, everything is fixable and adjustable, but take it to an expert. Here are the main bits and pieces that make up a guitar. 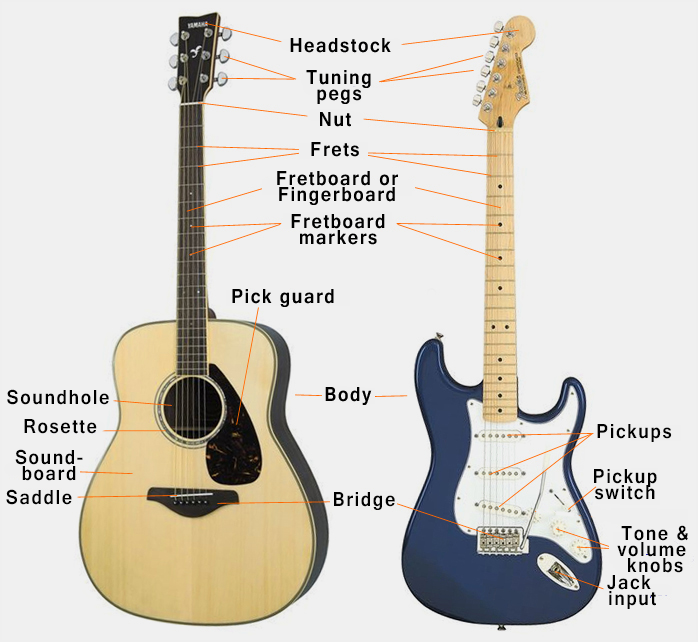 Apart from the electronics, both acoustic and electric guitars are pretty much the same. The principle behind guitars is simple: To stretch precision made wires (the strings) down the length of a finger board and tighten them to certain pitches. The strings are held up and stopped at one end by the nut, the other end by the saddle, which is part of the bridge. They're fastened at one to the bridge and at the other to the tuning pegs, or machine heads. The frets, which are wires inserted into the fretboard, allow the player to accurately shorten or lengthen the strings with the finger tips so as to change the pitches of the notes and make music. The tension applied to the strings is adjusted with the machine heads. The tighter the tension, the higher the pitch. Acoustic guitars get their volume from the soundboard. When the player twangs a string, it vibrates and passes that vibration onto the soundboard via the bridge. It's the vibrating soundboard that we hear as 'guitar'. The soundhole allows the sound generated inside the body to escape and add to the overall tone. Electric guitars get their volume from the pickups, which are essentially microphones. The vibrating strings affect the magnets in the pickups which send a signal to an amplifier down a cable which amplifies the signal and sends it to the speakers, and we hear the sound as 'electric guitar'.